Alopecia is the general medical term for hair loss, and it has many different causes. Normal human hairs can be classified according to their phases of growth. Anagen is the growing stage of hair, while telogen is the sleeping stage of hair. About 80 percent of the hairs in the human scalp are growing hairs and about 20 percent of them are sleeping hairs. It has been estimated that the scalp normally contains about 100,000 hairs. Therefore, the average number of hairs that can be lost in a day is about 100. Contrary to popular belief, neither shaving nor hormonal changes, such as menstruation, has any effect upon hair growth. Hair loss can be broken down into several different types, including alopecia areata (temporary hair loss in a coin-shaped patch), telogen effluvium (temporary hair loss secondary to a stressor on the system), and androgenetic alopecia (male-pattern hair loss). For the purposes of our discussion, we will focus on male-pattern hair loss. It generally shows itself in the 20s or early 30s by gradual loss of hair, chiefly on the top of the head and in the angles at the frontal hairline. There are several different patterns to this hair loss, but male-pattern hair loss is the most frequently encountered type. The exact mechanisms are still unknown. We have no doubt, however, that inherited factors and the effect of androgens (male hormones) on the hair are most responsible. We hope this covers everything on 'What Causes Hair Loss?'. if you are unsure of anything or require further advice regarding your treatment. Stress does not cause hair loss—it simply makes a bad situation worse. Telogen effluvium, for example, occurs after an insult to the system. The most common cause is pregnancy. This can result in extensive and worrisome hair loss in women in the first few months after the birth of a baby. It is, however, temporary and returns completely. We recommend the use of Vitastim, in all cases for best results. We hope this covers everything on 'Can Stress cause Hair Loss?'. DHT stands for dihydrotestosterone. This is the active form of the male hormone testosterone. It has been suggested that high DHT levels in genetically predisposed hair follicles initiate baldness. It is this chemical conversion from testosterone to dihydrotestosterone that is blocked by saw palmetto, which is the active ingredient in Biostim. Biostim blocks the formation of active testosterone and allows those hairs predisposed to inactivity to become active again and make new hairs. We recommend the use of Biostim, in all cases for best results. We hope this covers everything on 'What Is DHT and How does It cause Hair Loss?'. Although not the primary cause of male-pattern hair loss, genetics does have a significant role in male-pattern hair loss. It is, however, polygenic, in that there is more than one factor at work. It is unclear whether having an affected mother or an affected father predisposes descendants to greater risks. We hope this covers everything on 'Is my Hair Loss Genetic ?'. Can Hair Loss Occur in teenagers? Male-pattern hair loss can occur as early as 15, although it typically begins anywhere from the 20s and early 30s. Familial history may help determine if this is going to occur, as parents with a history of early-onset male-pattern hair loss may increase the risk for this to occur in descendants. Alopecia areata and telogen effluvium, two other forms of temporary hair loss, can occur in children as young as one year of age. Other precipitating factors may also be involved. We hope this covers everything on 'Can Hair Loss Occur in teenagers?'. What is the Cause of Sudden Hair Loss? Stressors to your system, such as illness, high fever, pregnancy, extreme weight loss or gain, and drug use, can cause temporary hair loss. This occurs when the ratio of growing to resting hairs is upset and more of the growing hair shifts into a resting phase. A greater quantity of normally sleeping hairs falls out, prompting a visit to the dermatologist. This type of hair loss is temporary and full regrowth should be expected. We hope this covers everything on 'What is the Cause of Sudden Hair Loss?'. An allergic reaction to any constituent in shampoo or hair products can cause hair loss. Shampoos are designed to be as safe as possible, although there is always someone who will react to them. Caustic hair dyes, straighteners, and other products can certainly cause inflammation of the scalp and result in hair loss. We hope this covers everything on 'Can Shampoos and Other Hair Styling Products Cause Hair Loss?'. Can My Hairstyle Cause My Hair to Fall Out? Certain hairstyles can contribute to hair loss, most notably styles involving tight braids or pull-backs. This form of hair loss is called traction alopecia. This occurs when the hair is pulled tightly back and fastened at the base of the skull, or braided into tight braids or rows. Exposure to this type of hairstyle over long periods can result in a scarring alopecia, with no potential for regrowth. We hope this covers everything on 'Can My Hairstyle Cause My Hair to Fall Out?'. How Does Minoxidil Work and is there an alternative? Minoxidil (Regaine) is a slightly oily solution that is rubbed into the scalp twice a day, or as recommended by your dermatologist. In its oral or intravenous form, it is a potent anti-hypertensive medicine, used in emergencies to lower critical blood pressures. It was during this use that hair growth was noted in patients with hair loss. Its exact mechanism of action is unknown; most experts feel that it causes dilation of the blood vessels in the scalp and increased exposure of the hair follicle to this flow. It has been shown to work best on the top of the head and less well at the angles. Its predominant effect is to decrease loss and maintain existing growth. We hope this covers everything on 'How Does Minoxidil Work and is there an alternative?'. Are High-Strength Minoxidil Formulas better than Lower-Strength Ones and is there a natural equivilant? We hope this covers everything on 'Are High-Strength Minoxidil Formulas better than Lower-Strength Ones and is there a natural equivilant?'. Treating Hair Loss Better Than Finasteride? Saw palmetto is a small palm tree native to the eastern part of the United States. The berries contain a biologically active component similar in action to finasteride. The fat-soluble part of these berries has been shown to inhibit the conversion of testosterone into the active form, much like finasteride. Although there are several double-blind studies comparing saw palmetto to finasteride in the treatment of benign prostatic hypertrophy (enlarged prostate), there are no studies looking at its use in hair loss. Treating Hair Loss Better Than Finasteride?'. Finasteride (Propecia and Proscar) has been shown effective in the treatment of mild to moderate male-pattern hair loss. These results were based on two 24-month studies of men ages 18 to 41. About 80 percent of the men in the study maintained their base hair count (versus 28 percent on placebo), while 66 percent had visible regrowth as rated by independent observers (versus seven percent with placebo). Most of the men in the study reported an increase in the amount of hair, a decrease in their hair loss, and an improvement in their appearance. We hope this covers everything on 'How Effective Is Finasteride?'. What’s the Difference Between Propecia, Proscar and Biostim? Propecia and Proscar are two forms of the same medicine, finasteride, but in two different dosages. They both block the conversion of testosterone into its active form, allowing hair growth. We hope this covers everything on 'What’s the Difference Between Propecia, Proscar and Biostim?'. How Long Does It Take to See Results From Any Treatment Program? It is recommended with both minoxidil formulas and Propecia that a person uses them for 12-month course before any decisions on efficacy are made. When considering the other temporary forms of hair loss, each individual is treated according to their needs. We hope this covers everything on 'How Long Does It Take to See Results From Any Treatment Program?'. 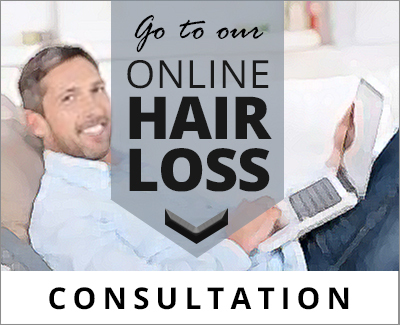 The consideration of when to undergo hair transplant surgery is a personal decision. Its success is based on many factors, including the amount of donor hair available as well as the amount of area that needs to be covered. An evaluation for hair transplant surgery with a qualified hair transplant surgeon is most important in determining when surgery should be considered. As a rule, hair transplant surgery is more successful when there is still existing hair that can be used to camouflage the surgical area. The goal of a successful session is to allow the patient to continue to recede in a natural and expected manner, rather than with unchecked hair loss. If you have enough hair with which to cover the thinning area, all the better. We hope this covers everything on 'When Should I Consider Surgery to Treat Hair Loss?'. How Effective Is Hair Transplantation? Hair transplantation is a surgical office procedure for the treatment of hair loss. This is accomplished by actually transferring grafts or small sections of hair bearing skin from the back of his scalp to bold areas on the top of the head. Micro grafts, containing one hair, and mini grafts, containing two to seven hairs, are usually used. This technique is very effective in most types of hair loss, including male and female pattern loss. It is also effective when concealing scar injury and complications from disease. It is especially effective in concealing the scars from facial plastic surgical procedures (face lifts, brow lifts, etc.). Even eyebrows can be reconstructed with excellent cosmetic appearance. Women in particular are excellent candidates, as their hair loss tends to be diffuse and can afford them full coverage of the area while undergoing healing. Best of all, your results are permanent. We hope this covers everything on 'How Effective Is Hair Transplantation?'. ANAGEN - This is the growth cycle in which cells divide and elevate to the upper portion of the hair bulb, as dead cells. Hairs in this growth stage become longer and larger. The anagen cycle normally runs in durations of two to seven years. CATAGEN- During the catagen stage the hair is separated from it's nutritional source and hair growth stops. The follicle begins to shrink and no melanins, which create hair color, are added. The duration of this cycle is normally two to three weeks. TELOGEN- During this cycle (which ranges in time from one to four months) the hair either falls out or is forced out by new growth. With a normal growing head of hair the anagen cycle begins again at this stage. Each individual hair is totally independent. The anagen stage normally involves between eighty-five percent and ninety five percent of the total number of hairs on one's scalp. The catagen stage normally involves less than one percent of the total amount of scalp hairs. The telogen cycle involves five to fifteen percent of total scalp hairs. When you are losing hair through pattern hair loss, the catagen and telogen stage are not accelerated but instead, the anagen stage diminishes on a gradual basis with the hair growing finer and finer and also shorter until growth is virtually invisible. We hope this covers everything on 'What is the hair growth cycle?'. How do I know I have a hair loss problem? I have been suffering from severe dandruff for a couple of years. I have tried expensive shampoos but they offer no help to my hair problem. In fact, my problem has become so bad I'm scared of wearing black tops. Please help! Dandruff can be caused by high sebum production, an increase rate of cell multiplication in the epidermal layer and excessive presence of a micro-organism called Pityrosporum. It can also caused by allergic reaction or extreme dry humidity. Keeping your scalp clean is the best preventive measure and daily shampoo is highly recommended. Medicated shampoo can control a minor scaling problem but frequent usage can aggravate the condition. It is advisable to rinse hair and scalp thoroughly after shampoo. If one condition persists, there could be a more serious underlying scalp disorder. We suggest you speak to one of our trichologist who will be able to help you analyze the problem thoroughly. I have an oily scalp and I wash my hair twice a day. My forehead is receding and also my top is thinning. I am worried about my physical appearance if this problem persists. Can you advise me what I can do to improve my current condition. You are probably suffering from androgenetic thinning (Male Pattern Baldness). This is a hereditary condition. The production of testosterone on the top of the scalp reacts to an enzyme called 5-alpha- reductase converting to di-hydrotestosterone (DHT). Presence of excessive DHT inhibits hair growth or shortens the growth cycle. It also increases the production of oil. Stress too, can aggravate the situation. You have to continue with twice daily shampoo and somewhat live a less stressful lifestyle. You may also wish to have your hair and scalp analysis by a hair professional - telephone us and speak to one of our trichologists. I'm in my early twenties. I noticed a balding spot in the center of my head and my hair is falling out at an alarming rate as my sink clogs everyday when I wash my hair. Please tell me what I can do about this problem. It's seriously affecting my confidence. The bald spot mentioned could be alopecia areata condition whereby a group of white blood cells attacks the skin or hair follicles. This problem can be caused by viral infections, vaccinations, trauma to the skin or even stress. When the hair is falling out at an alarming rate, this could be due to telogen* effluvium or loose anagen* syndrome. With this condition, the hair growth cycle is prematurely changed to dying stage. Hence, the normal hair cycle has been altered resulting in heavy hair falls. Typically for those who try to lose weight quickly by denying protein in their diet suffer from the problem. A serious trauma or stress which occurred about 3 months ago could also disrupt the hair cycle. It is best to speak to one of our trichologist before any form of treatment can be recommended. Both problems mentioned are temporary and can be helped if treated quickly. *telogen effluvium - anagen stage abruptly change to telogen. *loose anagen - despite the growth cycle, the hair can easily shed through combing and shampooing. We hope this covers everything on 'How do I know I have a hair loss problem?'. I have recently given birth and my baby is 3 month old. I am experiencing some hair lost problem. I am told this is temporary due to the hormone changes in my body but I kind of worry as I generally do not have thick hair. Can you advise me what can I do to reduce the hair fall lost during this period. During pregnancy, because of hormonal changes, your hair is probably at its best.The growth (Anagen) stage is normally prolong. Henceforth after childbirth, the hormonal changes reverse back, thus the accumulated amount of hair falls; that should have fallen during pregnancy. The hair that are due to fall, will fall, but your concern should be on the regrowth. Clean, healthy scalp with balanced diet would help, however, telephone and speak directly to one of our Trichologist in The Hair Centre for advise and they will assist to strengthen and nourish hair roots, giving your hair the best texture. We hope this covers everything on 'Hair loss after pregnancy'. We hope this covers everything, but please do not hesitate to contact us on 0207 152 4473 or go to our Email-Form if you are unsure of anything or require further advice regarding your treatment.